We have decided to welcome the year of 2017 by posting our Views and Reviews for January 2017 issue of Safari – a knowledge and science magazine from India – Gujarati edition. However we publish reviews only after reading it completely, we have started with an inspirational article exploring take aways from Indra Nooyi and Doug McMillon’s conversation at GBS Stanford, which we found fantastic. While December 2016 issue of Safari (Gujarati Edition) have a detailed article on Indian Government’s efforts of Demonitization by cancelling currency notes of Rs. 500 and Rs. 1000 with immediate effect. It bring a huge amount of money into mainstream which was otherwise unaccounted or un-taxpaid. Now moving ahead, the Government of India pushes the “Cashless” economy to take over. And it is expected to have a detailed article about the same in this issue of Safari – and we are not disappointed here. The cover page is having cheerful colors for both text and background. 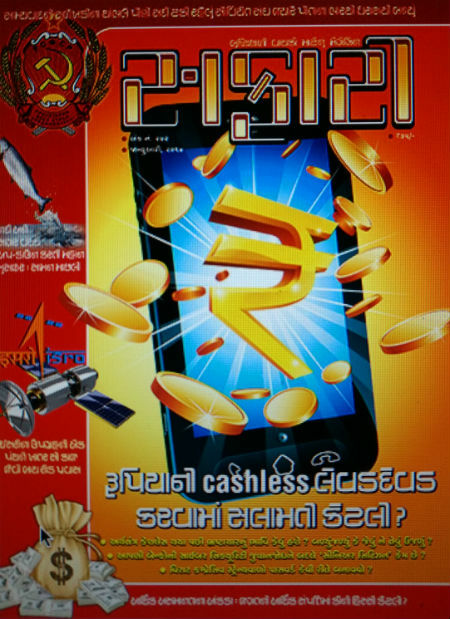 It also lists the major articles in the issue including the one about the CashLess transactions. We consider the editorial – one of the most important segments of any print media. It actually gives the editor a chance to share his/her vision about the content of respective media. It also gives him/her a chance to share something which came later to attention and a detailed article was not possible. This time editor talks about his views about India’s strength in terms of nuclear weapons and weather it should stick to it’s “no first use” policy or not. Well, you can read about it and agree or disagree with him, but remember that the defence minister of India have already represented his “personal views” about this policy earlier. The Plastic currency and why it is and advisable option is discussed a little in the back of the front cover page. It is small yet worth reading piece of article. While Indian government is pushing (rightly) the people to make as many cashless transaction as possible. As it doesn’t require physical currency and it results into a lot of ease in terms of security, printing and many other aspects, it is a good move. However it is also worth to note that the banks are the primary targets of Crackers (precisely we cannot call them Hackers, as there is a huge difference between both). The networks of Bank and Digital Wallets must be ultra-secure. The article published in Safari talks about the current status of Bank/Card/Wallet networks unbiasedly. The article also talks about the “requirement of transparency” in such organizations. For example, if anything wrong happen, then the authorities should have inform the people at the earliest. Also the requirement of using latest OS in ATMs, better encryption and authentication standards, is also talked about in the article. Personally we have expected more technical details and various authentication/encryption standards in the article; but then, thinking from – general – point of view, the article contains most of the required details. We have read many articles about seeing how the parts of the satellite are carried using bullock-cart by ISRO – India. People often use that to make fun of India’s Space Research Program. And, they have predicted it to be a failure! As of now, ISRO provides the cheapest and most trustable services to many other countries to launch their satellites in the orbit. So, was it actually lack in fund so much at that time, that it couldn’t afford some trucks to move parts of a satellite?! Well, of course not. This article has the answer. It also bust the myth and gives information about many other thing involving ISRO. If you are Sci-Fi or Science enthusiast, OR if you are an Indian, you definitely should read the article. The nature is full of amazements! The article about Salmon fish is really very informative. This YouTube video will give you more information about Salmon Fish. The article is written in interesting manner and keeps you glued to it throughout. This article takes you through the history of Russia since the time it was USSR. How Marxism, Communism, Leninism took over Russia and how eventually Mikhail Gorbachev and Boris Yeltsin shaped it to what it is now – is explored in quite interesting manner. Usually history is considered as boring subject to go through. But the article is written so well, that you will not realized that you have completed it. Why Indian Government raise railway fares during budget and in-between? Isn’t it unfair to the passengers? As sound is also a form of energy, is it possible to convert it to electrify? What is the reason behind hair-fall in us? Why women are not prone to baldness? Super Quiz is another segment which you should not miss. There are a number of magazines appear in the market every month, however a very few of them are worth your time and money you spent for it. This issue is definitely worth going for. Also the issue of piracy of Safari magazine is mentioned and it is also mentioned that the editorial team have already taken counter steps towards it. Please support it by purchasing legitimate version only.